I see them walking down the aisle of the plane: the pregnant lady and her husband. Fingers crossed, I watch as they wiggle their way past the old man struggling to place his carry-on in the overhead compartment. The woman waddles closer. It isn’t looking good. A few more steps and they have settled themselves into the seats next to me and I have lost my escape route. Traveling alone and now trapped in a window seat, I ready myself for the 15 hours it is going to take me to cross over the Pacific Ocean and land in New Zealand. My muscles are already starting to cramp from the two flights it took me to get from Minnesota to Los Angeles and my stomach turns with a mixture of anticipation and goodbyes. The words bounce through my head like a toddler looking to escape their crib. A common phrase my co-workers uttered when they found out I was leaving to the other side of the world. This idea of my bravery still makes me uncomfortable. Am I brave because I am leaving my home, family and friends to follow my ever-growing desire to explore the world? Or am I just driven by my own self-interest? While this adventure to Australia is a new animal for me, I have never found that traveling requires me to be brave so much as resilient, quick thinking and dependent on my common sense. I am on this airplane because I want to be a better citizen of the world by exploring unfamiliar environments and understanding the ways in which others live. I am not braving on a quest to defend good and defeat evil. If I am brave at all it is because I decided to be fearless in following my interests despite the heartbreak of leaving home. Safe and familiar, home is a place I understand. There, I know who I am and what I need to do. I have no need to question the reality in which I live in. I don’t need to challenge myself with new decisions and unexpected options. I simply have to exist. Glancing down at the woman’s swollen belly next to me, I don’t feel anymore unsafe than I have on the other flights I have taken with friends and family. And I am still a little offended by this question since it seems to comment more on my good judgment and understanding of which situations are safe rather than on a vague, generalized threat to solo female travelers around the world. A few weeks before this flight, a car crashed on the entrance ramp I used every day to get to work. For days, bits of car littered the dirty snow on the edge of the road before the newspaper ran a few lines about the injuries and loss of lives. There is so much risk in everyday life that I don’t believe that traveling alone or staying at home makes much difference. My assessment of risk doesn’t change based on my location. I know that stove tops are hot, dark alleyways are bad shortcuts, and strangers can claim to be anyone. Being safe is balancing the risk we face just by living and trying to do our best to avoid the unsavory. Settling back into my chair, I know that this plane may never land and I could be lost to the Pacific. I know I am moving towards a change that is incomprehensible. I know that by getting on this plane I am already a different person than I was before. The only perception of my life that matters is the one I have. 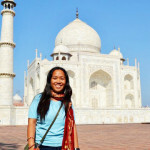 Have you enjoyed being a solo female traveler? Email us to share your experience and advice with the Pink Pangea community. We can’t wait to hear from you! Thank you for this. I’m not a *solo* female traveler, but even when I’m going with a group or meeting a friend across an ocean, I get this question so much, and so very much related to this article. Safe and happy travels to you!